Components of our Facilities - Innovative Solutions for Wastewater Treatment | Organica Water Inc.
Every Organica Facility begins with process design. This is Organica’s core expertise; we design a wastewater treatment process which produces clean effluent in very little space, with minimal operating costs. Organica then carries out careful calculations and creates a process flow diagram and a set of parameters which govern the operation of that particular Organica FCR Facility. This data is then supplemented with additional detail from our engineering team to produce a full Facility Design Package, including a P&ID, basic civil/architectural drawings and a complete equipment list. The result is a complete toolset which can be used by any EPC or General contractor to build that specific Organica FCR Facility. We then carry out careful calculations and create a process flow diagram and a set of parameters, which govern the operation of that very process. This data is then supplemented with additional detail from our engineering teams to produce a full facility design package, including basic architectural drawings and a complete equipment list. The result is a complete toolset which can be used by any EPC or general contractor to build that specific Organica FCR Facility. At the heart of an Organica FCR Facility is the Organica Biomodule. Designed to fit securely into the biological reactors, each Biomodule acts as the support structure for both the plants whose roots make up the primary biofilm carrier, and Organica’s patented biofiber media designed to mimic the structure and function of the plant roots. 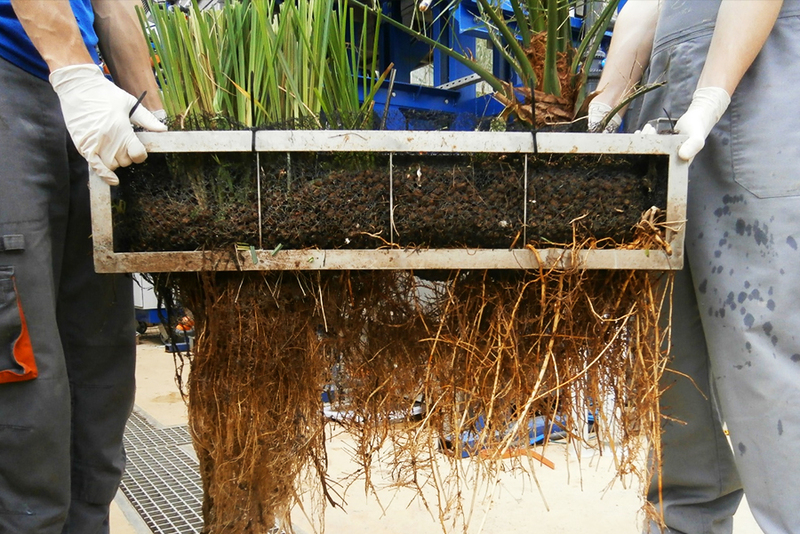 The root structures in turn provide an ideal habitat for a thriving ecosystem – both larger (2-4x greater active biomass per cubic meter of reactor volume) and more diverse (3-4x greater species diversity) than the biology found in typical conventional activated sludge based systems. This results in the development of a distinctive self-regulating ecosystem with operational flexibility and high resilience to unexpected influent fluctuations and shock-loading. 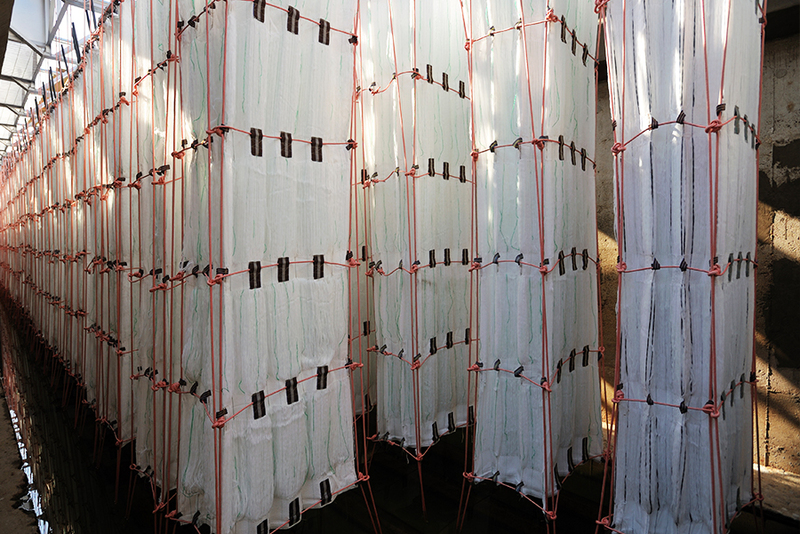 In addition, because the Biomodules support this unique biofilm fixed on the root structures, the process utilizes much lower suspended solids content in the water (typically 90% less than conventional suspended growth systems). These lower suspended solids content improves oxygen transfer efficiency and results in significant energy savings. The Organica Discfilter is a mechanical filtration device specially designed to remove total suspended solids (TSS) from wastewater streams following biological treatment in an Organica FCR Facility. Each discfilter incorporates a simple, yet sophisticated, design that ensures continuous low-maintenance operation and stable, reuse-quality effluent; all with a drastically reduced footprint over conventional secondary clarification. As an Organica FCR Facility is a fixed-film system utilizing biofilm that is attached to root structures, the suspended solids content of the water in the treatment process is low (100 – 300 mg/l). This allows the use of Organica Discfilters for phase separation directly after the biological treatment step. The Discfilter’s advanced design consists of multiple filter discs constructed from modular demountable cassettes attached to a revolving inlet drum. The configuration maximizes the filtration area which makes an exceptionally small physical footprint possible, reducing land requirement by up to 90% in comparison to conventional secondary clarification. 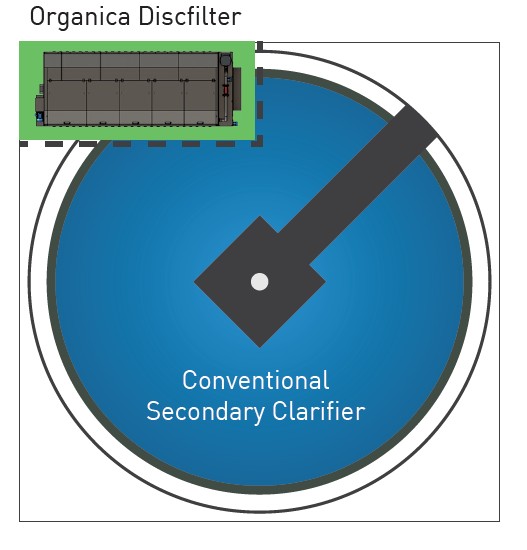 Thanks to their compact footprint, Organica Discfilters are perfectly suited to be installed in the wastewater facility building itself, further decreasing the physical and psychological footprint of the Organica Facility and adding to the aesthetically pleasing visuals. Organica Discfilters are able to meet performance requirements of a wide range of effluent TSS limits, including constantly producing reuse-quality water. Reclaimed water can be utilized for a number of purposes, including irrigation, industrial cooling processes, feeding A/C cooling towers, toilet flushing or groundwater recharge. What is more, due to the low TSS leaving the last reactor zone, phase separation can be accomplished by a single-stage discfilter down to 5 mg/l TSS with the correct chemical conditioning. As part of each Organica FCR Facility, Organica supplies and installs its process control software, custom programmed to operate the Facility efficiently and in an automated way. Organica utilizes a PC-PLC based process control system, integrating the acquisition, display, and storage of operational data, as well as the input and application of operational variables. 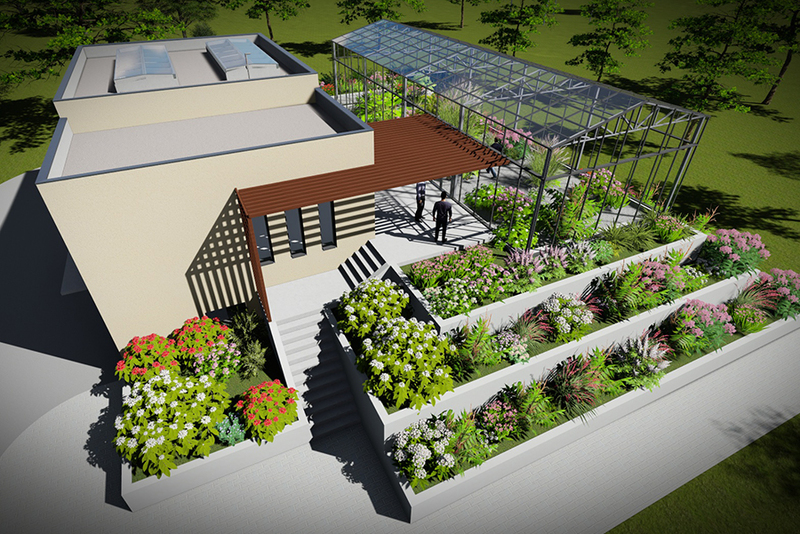 The control and management of the Facility relies on the data gathered from the sensors and probes installed in the Facility, specified by Organica at the design stage. 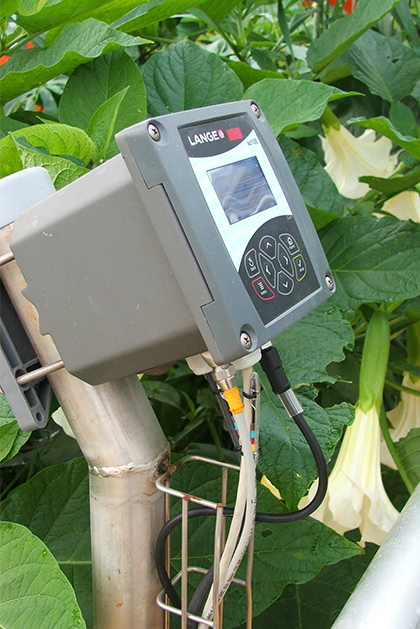 The flow of wastewater is measured by electromagnetic meters and level indicators, while the optimization of energy consumption requires data from dissolved oxygen probes linked to variable speed drives controlling the blowers. Pump capacity is regulated via variable speed drives and electromagnetic or pneumatic controllers which regulate valves. All equipment is controlled by a PLC, which monitors their status through feedback channels and displays it on the application program. The process control software provides an easy-to-use graphical interface for operator interaction and ensures secure operation of the whole treatment plant. The operational savings from this high level of automation are significant, as with this level of sophistication Organica facilities require very few personnel for safe operation. In addition, the ability to establish secure online connections enables Organica engineers to provide clients with remote monitoring capability and various Digital Services. Using the online interface, engineers can remotely view, evaluate, and provide input to optimize Facility operation. As part of its Digital Services, Organica supplies and installs highly automated control software, custom programmed to operate the wastewater treatment plant (WWTP) efficiently, while also allowing for seamless operation. Organica utilizes a PC-PLC based process control system, integrating the acquisition, display, and storage of operational data, as well as the input and application of operational variables. The control and management of the Facility relies on the data gathered from the sensors and probes installed in the WWTP, provided by either Organica or a third party. The flow of wastewater is measured by electromagnetic meters and level indicators, while the optimization of energy consumption requires data from dissolved oxygen probes linked to variable speed drives controlling the blowers. Pump capacity is regulated via variable speed drives and electromagnetic or pneumatic controllers which regulate valves. All equipment is controlled by a PLC, which monitors their status through feedback channels and displays it on the application program available from an online interface. The process control software provides an easy-to-use graphical interface for operator interaction, ensuring secure operation of the entire treatment plant. The operational savings from this high level of automation are significant, as with this level of sophistication facilities require very few personnel for safe operation. In addition, the ability to establish secure online connections enables Organica engineers to provide clients with an Operational Supervision service. Using the online interface, engineers can remotely view, evaluate, and provide input to optimize WWTP operation. The Organica BlueHouse is a packaged plant solution, which is a custom-engineered and pre-fabricated facility that captures all the benefits of Organica-powered wastewater treatment and reuse in one easy-to-install package. While having an accelerated design and construction process, the facility still retains its compact, odorless and energy efficient features. As a result, the Organica BlueHouse is an ideal choice for applications where land value and efficiency is a top priority, and hydraulic flow do not exceed 400 m3/d (105,000 gal/d). The Organica Villa is a complete wastewater treatment facility for smaller capacity applications, delivering all of the advantages of a large scale Organica FCR Facility. The major elements of an Organica Villa are pre-engineered, which allows both Organica and its EPC partner to deliver smaller-capacity treatment at a much lower costs, suitable for up to 2,500 m3/d (660,000 gallons per day). 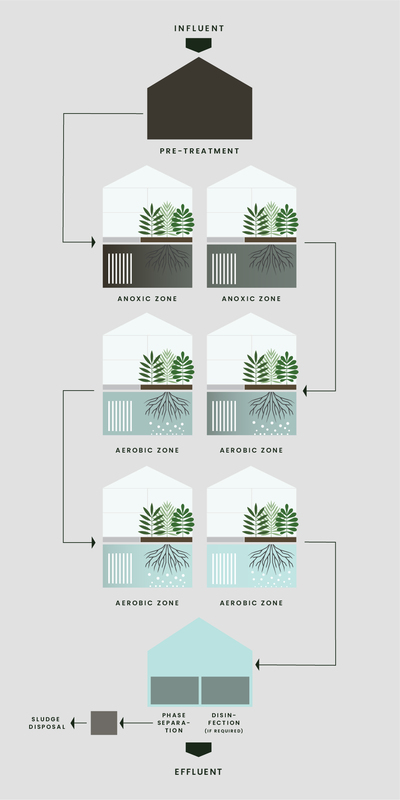 The Organica Villa is an ideal alternative when conventional wastewater infrastructure will not suffice, given the location or project requirements. With standardized detailed engineering packages, it is suitable for projects with tight timelines, strict footprint constraints, water reuse requirements, and in those areas where land value is high, or sewer connection is costly. The Organica Villa contains all required treatment steps including solids removal, biological treatment, sludge removal, and final treatment for reuse quality (if required). 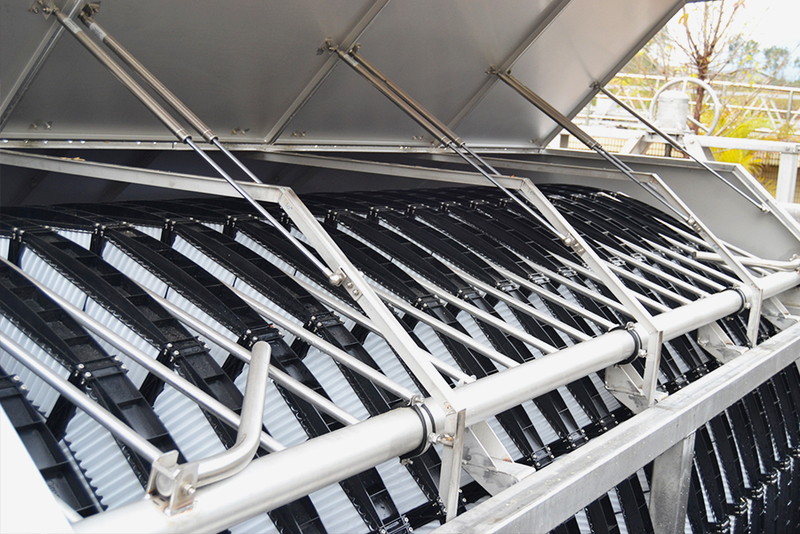 With its highly-automated operation, and ability to be located right where the wastewater is generated, the Villa can solve wastewater treatment requirements while minimizing infrastructure and operating costs in a timely, efficient manner. Our selection criteria depend upon several requirements, including wetland tolerance, width and creeping abilities, root structures, wastewater tolerance, odor impact, and aesthetical value. Organica FCR facilities always have plants present in the ecosystem, with their roots hanging into the reactors providing habitat for a robust contaminant-removing biofilm. One reason we use natural and engineered plants roots side by side is because of the unique ability of the natural plants to breath in and transfer oxygen to the biofilm in the reactors. To house the plants in the systemic environment we utilize special plant racks – part of the Organica Biomodule – which are capable of providing a steady enough platform for the natural plants. The mesh in the plants rack lets the roots and air pass through a special clay media and the root zone. The media in the plant racks is similar to the ones biofilters utilize as media for air treatment, thus the plant racks also play the important role of odor control in an Organica facility.